Last night my mom was in town so Ian and I took advantage of the best babysitter ever and went out to dinner! A dinner that did not involve crayons, chicken nuggets, or leaky sippy cups -- can I get a HALLALUYER. We went to Dogwood in the South Park area, and it was Ian's first time there for dinner. I'd been there for lunch and my baby sprinkle and knew the menu was awesome. I had the chicken dish, YUM, and I enjoyed a glass of rose to start and then a pinot grigio with my meal. We also had the bison carpaccio as an appetizer and it was amazing. I wore my new (to me) J. 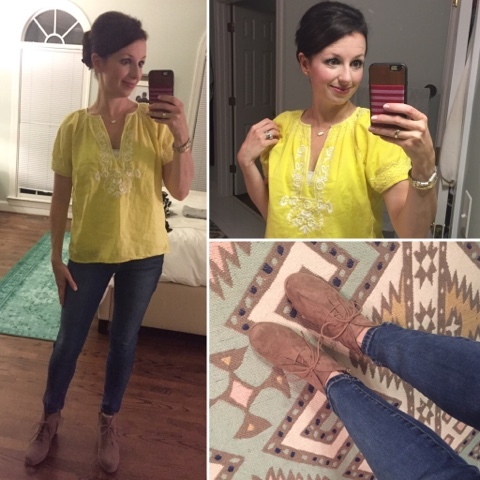 Crew top that I scored for $9.99 on Thred Up and my new Target booties! 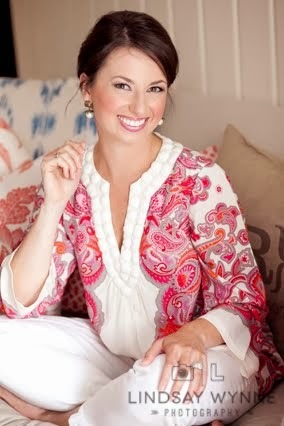 My fave neutral Kendra Scott necklace, the perfect pink lipstick, a little hair pouf, and I was all set. BTW, if you like that shirt from ThredUp, they have another XS listed (that's the size I went with). Just search for "J. Crew Factory Short Sleeve Blouse" and you'll find it. They have it for $9.99. Use my referral link here and they will give you $10 to shop! Speaking of those Target booties -- I bought them for $35. Well, of course they are on sale now for $28! You better believe I am going to get a price-check on them. After reading the reviews online, I sized down from a 7.5 to a 7. I only will be wearing them with slim ankle socks so I don't need to have room for thick socks. When I first put them on last night, I initially felt a little silly walking around ... clunky. It's sort of like when you used to go rollerskating and the skates feel crazy at first and then they just feel like an extension of your feet. So, if you try these on in store and aren't sure about walking in them, rest assured that they feel extremely normal after a few minutes! And Ian loved them! I think because they're sexayyy without being over-the-top like stilettos. They really elongated my legs when worn with skinny jeans, and for someone 5'2", that says a lot! I picked up a cute pumpkin costume for Charlotte already but then saw this adorable gown from Nordstrom for just $15. What a great easy costume idea for a wee one, or a cute gift for a new baby! It's 0-6 months which is that perfect size for the "do I dress up my newborn?" quandry. It's by Mud Pie and they have a ghost version too, also $15. Free shipping and returns, natch. 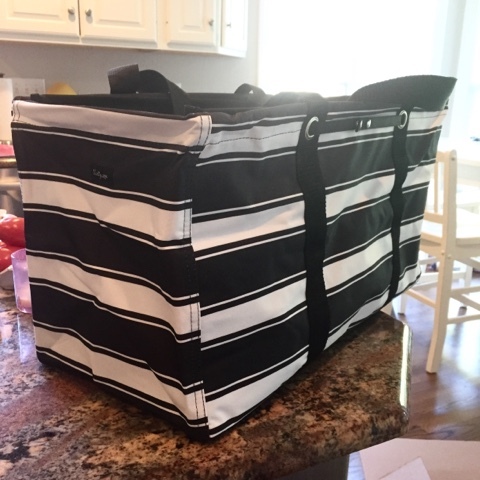 This past weekend my Thirty One LUT (large utility tote ... I love that it has its own acronym) arrived! I am SO happy that I ordered this fun black and white print and also went for the stand tall insert. It's amazing how big it is and now I honestly wish I had about four more. I'm torn on where/how to use it. Ribbon and tool storage for making hairbows? Does it stay in the trunk to keep all little things corralled? Does it chill in our mudroom as a catch-all for hairbows, sandals, and scarves? I can think of a gazillion uses. How do you use yours? As a reminder, my friend Justine sells this line and she is a GOOD person. So sweet, so thoughtful, and a mama of five! She's an organization queen so, in my mind, the perfect person to represent a line of items to help get your life more organized and streamlined. I have the same Thirty-One tote and I use mine in my closet as storage for seasonal items. So in the summer I put away my hats, mittens, etc. and in the winter it keeps all of my bathing suits and beach bags out of the way. I've also seen people bring them to consignment sales (which is genius). I have the same booties from Target - I definitely wasn't sure when I first tried them on but I'm so glad I grabbed them. Mine were $35 too, ha! Love that yellow on you! I love wearing yellow but have to be very careful as a pale blonde- things can get very unattractive very quickly! I say buy a few more totes! Haha. I have one in my SUV, one in the hall closet (as my catch-all spot, for easy access to put everything away at once) and one in our guest room where I store the items I'm selling on various websites. I'm anxious for my new stand tall insert to arrive! That's going to stay in the car to keep the random items from falling out. I almost bought those booties from Target and now I'm kicking myself for not! They are darling! I just love you & all of your thrifty ways!!! Super cute top! I really need to give thread up a try bc Stitch Fix is not for me - too pricey & my stylist well, was not great. 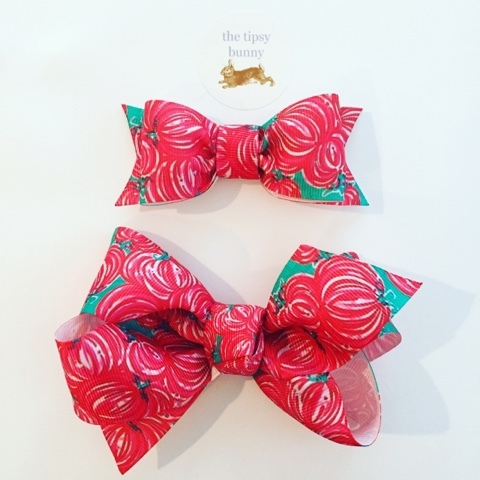 Gah those pumpkin bows are adorable! I just got those booties yesterday!! I had to size up with them as I'm having some weird toe issue...these were the first booties that we comfortable!! I wore them all around the store switching between two sizes and I really like them. Since becoming a SAHM I don't wear heels very often so these are a nice change!! !